US, 1985, 113 minutes, Colour. Kevin Costner, David Marshall Grant, Rae Dawn Chong, Alexandra Paul, Janice Rule, Robert Townsend, Jennifer Grey. 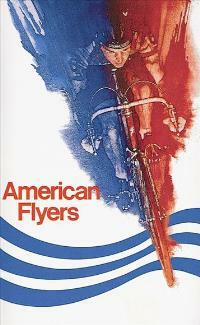 American Flyers is a very entertaining film. It is about family and family relationships rivalry between brothers, terminal illness. It also focuses on a championship bike-ride - and has excellent photography in Colorado locations of the competition. The film was directed by John Badham (Saturday Night Fever, Blue Thunder, War Games, Short Circuit). Kevin Costner (Silverado) is good as the older brother as is David Grant as the younger brother. Janice Rule has a strong role as their mother. While there is nothing particularly new, the film treats familiar characters and themes with a great deal of human warmth. 1. An entertaining film? Humane? Piece of Americana? Sports film? 2. The world of cycling: the races, training, the competition, the Rockies? Stunt work? Photography, editing? Family life, the university, sports training centre? Authentic atmosphere? Audiences identifying with characters and situation? The musical score and its spirit? 3. The title and its reference to cycling? Americana? Ethos, achievement, competition and competitiveness, energy, sport? 4. The background themes of illness, fear, hysteria? David and his concern about his health? His father's death and its consequences? The mother and her inability to cope? David's antagonism towards Marcus? Marcus and his disappearance at his father's death? Concern about David?, The sudden switch in audience sympathies when they realised that Marcus was ill? Coping with illness? 5. The focus on David: his initial riding, youthfulness, study and giving up study, his mother's concern, Marcus and his absence, the father's death and resentments? Marcus's arrival and the tense meal, the clashes? His going to the sports centre with Marcus? The visit to the centre, the tests, breaking his brother's record on the exercise machine? Meeting Sarah and putting his foot in it? The girl invited to the meal, his angry outburst and humiliating the girl? The tests and his not hearing the doctor correctly? Misinterpretation? Marcus's proposal about the race? Training with him, sharing with him? Meeting Becky, attracted by her, her travelling with them? The ride, the race, the rivalry? Marcus's victory on the first day? His night with Becky (and the television set, the National Anthem and the phallic symbolism)? Marcus's advice about techniques for the second day, his outpacing his rival and the Russians? The illness and his anger about the truth, having to cope, having to ride? His mother's arrival? The final day and his being edged into the gravel? The build-up to the finale? The family reunited? family, brotherly love? The strong bonds? 6. Marcus as the older brother, the photo of the two boys, his being a doctor; his father's death, the audience sharing the point of view of David and his mother, absence, visit, clashes, his concern about David's health? Taking him with him? The diagnoses? His own physical condition? His love for Sarah? The background of his racing, prospects, his dropping out and not finishing? The clashes with his rival (and the relationship with Sarah)? Winning the first day, his achievement? His becoming ill, their bringing him into the van? The advice for David? His mother's arrival, the reconciliation? His illness and impending death? 7. Their mother and her competence, her relationship with her sons, her husband's death and her hysteria? Clashes, the phone calls to the doctor? Her coming to the race? The reconciliation? The importance of the dead father and his illness? 8. Sarah and her relationship with Marcus? In the apartment? At the centre? her help, arranging the dinner and its failure, support of Marcus, the clashes with her ex-husband, driving, coping with the illness? 9. Becky and her health trek, clashing with her group, the hamburger place, meeting David, joining, the drive, the night with him, helping and sharing? 10. The sports centre, its facilities, exercise and training, health, tests? The humour with Randy and his not being in his father's image, continual eating, avoiding exercise? The doctor and his concern about Marcus? The telephone call to his mother? He and Randy present at the race? 11. The rivalry on the cycle track? The rival and his nickname of Animal, the clash with Sarah, his friend Jerome? The ride with the Russians, Marcus's victory, his resentment, edging David into the gravel, his loss? 12. The cyclists, especially the Russians and their competitiveness? 13. The race itself, the panoramas of Colorado, desert and forest, mountains and beauty, rugged, the thin air, pace, rules, energy, the gruelling aspects of the race, the support of the fans, the hoopla?